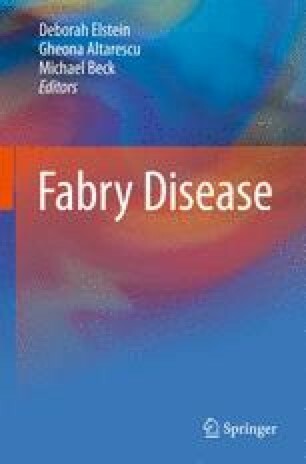 The more specific ocular manifestations of Fabry Disease (FD) are represented by corneal opacities (cornea verticillata), cataract, and conjunctival and retinal vascular abnormalities. Cornea verticillata is the most common ocular finding and consists of bilateral whorl-like opacities, located in the superficial corneal layers. These corneal opacities have been described in the large majority of the patients and so, at present, cornea verticillata is usually considered the most reliable ophthalmological marker of FD. Recently corneal deposits have been investigated by confocal microscopy, a diagnostic technology able to study the corneal structure layer by layer; this technique may provide more detailed information about the physiopathology of cornea verticillata and its changes with time. FD patients may also show a typical posterior subcapsular cataract with a ‘spoke-like’ appearance: this is a rare finding and cannot be routinely used for diagnosis and monitoring the disease. Conjunctival and retinal vessels tortuosity is very common but it is not specific of FD, as it can be observed in other vascular disorders. Moreover the evaluation of vessels tortuosity is very subjective and it can be difficult to quantify. Our group is presently developing a specific software for computer-assisted analysis of vessels tortuosity in digital fundus pictures.